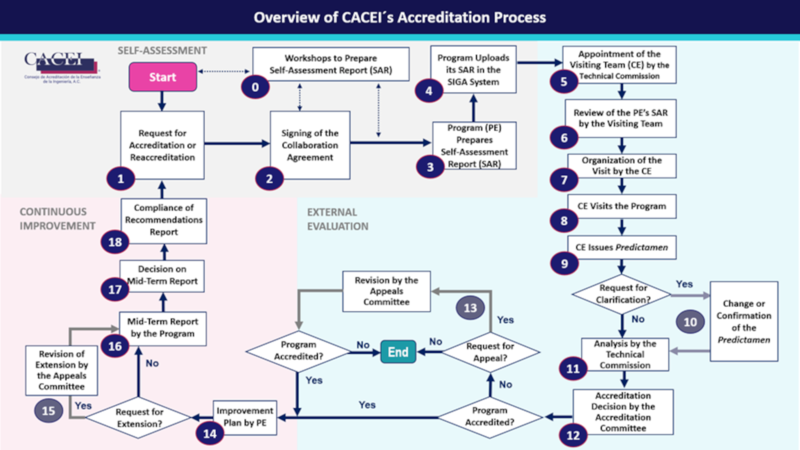 It is essential to know and be able to meet the accreditation process with CACEI. It is suggested that before starting the process formally, those responsible for the self-evaluation take the Self-evaluation Workshop: A vital process toward accreditation. Profile of the graduate competence. The official registration of the program must contain the registry code issued by SEP/DGP. Bank details for payment of the accreditation service. The educational program will receive a second email notifying the Control number of the evaluation process. This email is necessary to request access to CACEI’s Integrated System for the Management of Accreditation (username and password). If the educational program data happens to be incorrect, send CACEI the correct ones to avoid errors in the documents that will be generated during the process, to erika.romano@cacei.org.mx. The educational program will review and send the services agreement signed and will pay to CACEI accordingly. To request access to the Integrated System for the Management of the Accreditation (SIGA), the program shall forward the email (which contains the Control number, mentioned in the previous step) to ricardo.olvera@cacei.org.mx. To receive the access codes the program must previously have covered payment and signed the services agreement. CACEI will email the educational program the access code for the Integrated System for the Management of Accreditation (SIGA) to the email address registered in the Zero sheet as the Process manager. The educational program, through the Integrated System for the Management of Accreditation (SIGA), will upload their responses for each of the ten electronic questionnaires and will attach all the evidence requested in the Reference Framework. For this step, it is suggested to review the User’s Manual for completing the self-assessment report: http://cacei.com.mx/docs/man_auto.pdf. Upon completion, the educational program should send through the Integrated System for the Management of Accreditation (SIGA) the self-assessment report. The program will receive an email confirming the reception of the self-assessment report by CACEI. The educational program should send to CACEI a proposal with three tentative dates for the assessment visit. Those dates should be at least 45 calendar days after submittal of the proposal. The visit has a duration of two days. It is suggested that the visit be carried out Monday and Tuesday, or Thursday and Friday. The visit must be done during regular operation of the program, not during holiday or exams periods. CACEI shall notify the educational program which of the three proposals was accepted to carry out the assessment visit and will send information on the three evaluators who will integrate the Evaluation Committee that will visit the program. The educational program must agree with the Evaluation Committee the Agenda of activities for the evaluation visit, establishing all the activities and the estimated times for the realization of each of them. The educational program and the Evaluation Committee will conduct the visit as previously agreed. The Evaluation Committee will issue three reports: Summary of indicators, the SWOT matrix, and the Full Report. CACEI will send to the Technical Committee of Specialty the three reports generated by the Evaluation Committee for analysis, review, and issuance of a recommendation report to the Accreditation Committee. The Technical Committees of Specialty meet three times a year, in April, July, and November. The Accreditation Committee, as CACEI’s highest authority in the evaluation and accreditation, will review and analyze the recommendations of the Technical Committee of Specialty and shall deliver its decision on all educational programs evaluated by CACEI. Accredited for 3 or 5 years: The educational program must meet the Continuous improvement monitoring process. Not-Accredited: In case of disagreement with the decision, the educational program may apply for the Appeal process. The Accreditation Committee issues its decisions three times a year in May, August, and December.